Posted March 27, 2018 & filed under Service. Our first two blog posts in the maintenance plan series, Part 1 and Part 2, walked you through what a planned maintenance is and what the benefits are. Our blog series continues this week with our final planned maintenance post – Allied’s unique planned maintenance process. 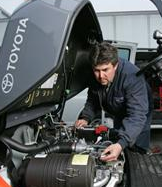 Each forklift follows Allied Toyota Lift’s 3-part planned maintenance process. Operation – Does the technician uncover any issues while the forklift is being operated? Physical Inspection – Does the technician see any wear, tear, or replacements needed? Fluids & Filters – What can the technician check, add, or replace to make sure your forklift is running smoothly? Allied’s technicians have been uniquely trained to follow a consistent process for planned maintenance. Using one of Allied’s state-of-the-art vans as home base, the technician drives the forklift from its location to the van. While driving the van, the tech completes the Operation checklist while in-use. This process allows the tech to experience the forklift in a real in-use setting, making sure any problems are detected and your unit is running in top-notch condition. Once the tech reaches the van, the tech performs the physical inspection portion of the maintenance process. The focus of this portion is safety. Our techs have an inspection checklist unique to your unit, making sure that each and every part is checked. This keeps your forks the appropriate thickness, chains from breaking, and each and every part checked to prevent any accidents from happening. Lastly, the fluids and filters are checked either adding or replacing as needed. The forklift is driven back to its working home with the tech making sure its back to perfect working order. 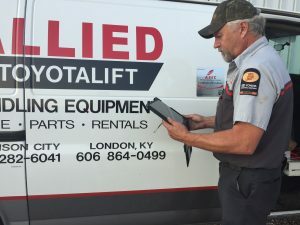 Each of Allied’s technicians has an internet-connected tablet operating a paperless service system that gives them immediate access to the background and repair history of every unit they maintain. They also have online and telephone access to Toyota support for tough to diagnose problems. This paperless service system tracks this whole process electronically so there is a record of every maintenance and every part checked. Read more about our system here (link to past paperless blog post). Allied’s technicians also have a voluntary turnover rate of only four percent per year. Our 39 technicians have a total of more than 325 years of experience with Allied (over 8 years on average), not counting experience prior to Allied. That’s a lot of experience coming to check on your forklift! When signing up for planned maintenance, ask about their planned maintenance process. Do they have a checklist? What are they inspecting? What do they check for? What kind of technician will be performing the planned maintenance? With Allied Toyota Lift, you can be sure that we’re taking the steps to keep your employees safe and your forklifts running. Want more information? Contact Allied Toyota Lift today.